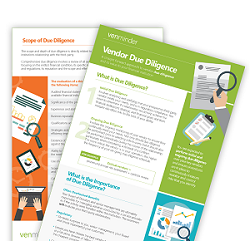 To properly manage risk, due diligence is an essential element to every vendor management program. Do you have the proper procedures in place to continuously measure, monitor and control risks? Examiners will evaluate your process of defining and mitigating risk on all key third party relationships. We're here to help. What is the importance of due diligence? What is the scope of due diligence?